Start about 1 1/2 cups water simmering in a small saucepan. In a heatproof container (I use my Pyrex measuring cup), dissolve the gelatin in the 3 tablespoons ice water. Allow to stand for 5 minutes. Place the Pyrex into the simmering water and stir the gelatin occasionally until the gelatin has dissolved completely. Cool slightly. Melt chocolate according to package instructions. I use the microwave method, which was to place the chocolate in a microwave safe bowl and cook for 2 – 3 minutes at medium power (50%), checking it halfway through. Once the chocolate has melted, stir. Be careful not to overcook the chocolate as it can scorch. Allow to cool for 5 – 10 minutes. Divide the eggs, putting the yolks into the bowl of a standing mixer and the whites into one of the bowls from the freezer. Using a hand mixer, whip the egg whites until stiff peaks form. In the second bowl from the freezer, using a hand mixer whip cream until soft peaks form. Add the sugar to the egg yolks and mix, using the paddle attachment, until thick. If using a vanilla bean, split the bean lengthwise and add to the egg mixture. Alternatively, add the vanilla bean paste or extract, and mix to combine. With the standing mixer running on low speed, slowly add the gelatin, and mix until well combined and slightly shiny. Remove the bowl from the mixer and using a rubber spatula, fold the egg whites into the chocolate mixture, ensuring to scrape the bottom of the bowl. Next, fold in the whipped cream just until well combined. Cover with plastic wrap and chill several hours (or overnight). 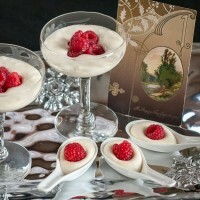 Spoon into serving dishes and garnish with fresh raspberries. * Note: Total time to make White Chocolate Mousse includes a minimum of two hours cooling time before serving.